As we approach the end of our Lenten journey, we are also entering one of the most powerful prayer opportunities in Catholic tradition. The Divine Mercy Novena begins on Good Friday and ends on the first Sunday after Easter, Divine Mercy Sunday. Most Catholics are familiar with the Chaplet of Divine Mercy, especially those devoted to eucharistic adoration. 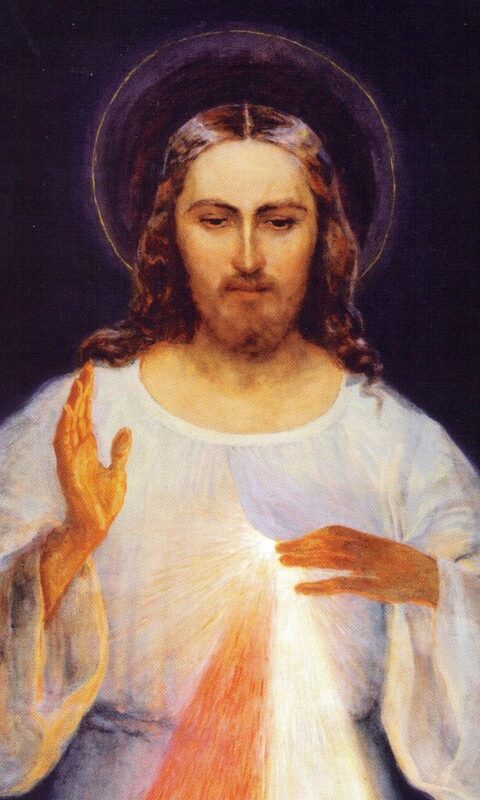 But what you might not know is the history of the Divine Mercy image commissioned by Saint Maria Faustina Kowalska, whose apparitions of Jesus Christ inspired the devotion. The image shown in this blog is known as the Vilnius image. It was painted in Vilnius, Lithuania, by artist Eugene Kazimirowski at the request of St. Faustina and her spiritual director Father Michael Sopocko. St. Faustina visited Kazimirowski every week for six months to make sure the image he painted was an exact reflection of Jesus as she saw him. This is the only image painted under the direction of St. Faustina and the only image she ever saw. Kazimirowski completed his painting in 1934 and St. Faustina died in 1938 shortly before World War II and the Soviet occupation of Eastern Europe. Under communist rule, faith practices weren’t allowed, Catholics were persecuted, and churches were closed. St. Faustina’s painting was — for all practical purposes — lost. Had the paining been done by a famous artist, it would have been stolen or destroyed. Instead, it was abandoned by the communists, but was secretly relocated, hidden, and cared for by the faithful who knew its true value. Ten years after St. Faustina’s image was painted in Vilnius, an artist by the name of Adolf Hyla, having survived World War II, wanted to make an offering of thanksgiving. Hyla visited the Congregation of the Sisters of Our Lady of Mercy in Krakow, Poland, offering them the gift of a painting of their choice. Not knowing what became of the image painted under St. Faustina’s direction, the Sisters requested that Hyla paint the Divine Mercy image of Jesus based on a small reproduction of Kazimirowski’s painting and the description from St. Faustina’s diary. Hyla’s painting was blessed and placed in the convent chapel; today it still hangs above the tomb of St. Faustina in the Divine Mercy Shrine in Krakow. Reproductions of the Hyla painting spread throughout Poland and Europe, along with the Divine Mercy devotion. Copies of the Hyla painting and the Divine Mercy chaplet were brought to the United States by those who emigrated from Poland. It is this image painted by Hyla that we see in most churches and adoration chapels today. St. Faustina’s original painting was hidden from the world until after the fall of the Berlin Wall, when it was discovered hidden in Belarus, marred by poor attempts at restoration and covered in wax to protect it from moisture. In 2003, a professional restorer removed the wax and previous attempts at repainting the image. It was restored to its original condition, exactly as St. Faustina had directed it to look. In 2005 the image was moved to the Church of the Holy Trinity, which had been refurbished and reconsecrated as the Shrine of Divine Mercy. It can be seen there today. The history of this sacred image is interesting to reflect on as we draw close to Divine Mercy Sunday. But whatever image you choose to honor in prayer — Hyla’s, Kazimirowski’s or any of the other reproduction — doesn’t matter. What matters is making the image a conduit for grace and remembering the focus of the devotion. God’s love is merciful. Call upon Him with trust, allow His mercy to flow through your heart and towards those who need it. The Divine Mercy Novena is a perfect completion of your Lent devotions; you’ll find instruction on how to say ithere.